Doomguy gets seven new levels of demon slaying and a built-in flashlight. With the re-release of Quake 4 nearly on shelves, Bethesda has revealed that Doom 3 is the next title it's resurrecting, this time as the BFG Edition. Unlike the Quake 4 re-release though, which is simply the original game being relaunched at a new low price, Doom 3: BFG Edition is a director's cut that will see new levels and a myriad of modern features added to the game. 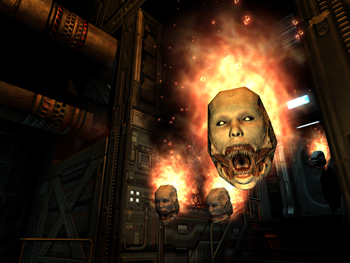 The update to id's claustrophobic shooter will include the original Doom 3, the Ressurection of Evil expansion and seven new levels titled "The Lost Mission." The two previously released games are being remastered, offering achievements and trophies, updated graphics and checkpoint saving. In a move sure to please players of Doom 3, Doomguy's armor will now have a flashlight attached to it, so no more putting your guns away to see if there's an Imp in that dark corner. The update will also include Doom and Doom 2, presented in their original style. Planned for release this fall, Doom 3: BFG Edition will mark the first time a Doom game has appeared on the PlayStation 3. The game is also being released for the Xbox 360. UPDATE: The game will also see a PC release.